Meshcards are here! 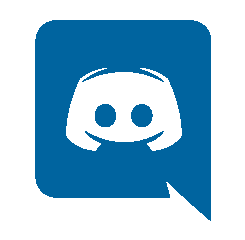 If you are not too sure what a meshcard is, don’t worry too much, it’s probably because you live in the US and haven’t left your room in a long time. Our friends over at Zoo Digital have partnered up with Meshcards.com to bring you an awesome deal. If you live in the UK head on over to this website, and fill out your information and you will receive 20 free meshcards! We still haven’t figured out what they really are, but they sure look awesome! 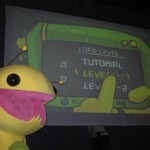 Remember Alien Hominid for the Gameboy Advance will be releasing on December 2nd for all of Europe, YAY! 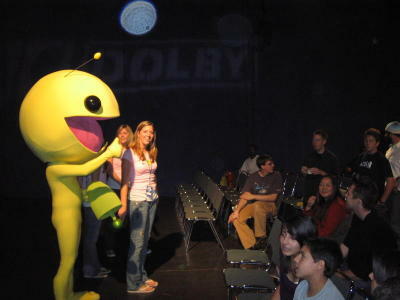 This past weekend we attended the first annual IGN LIVE. 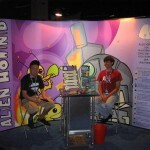 We had a great time showing everyone the upcoming version of Alien Hominid for the Game Boy Advance. 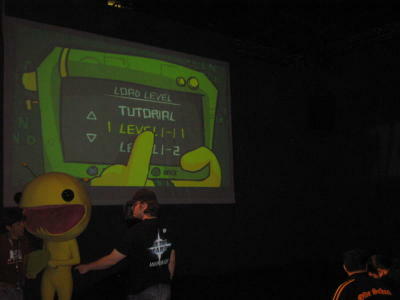 Be sure to check out the post and read about the setup for the event. Thanks for coming out and showing your support. 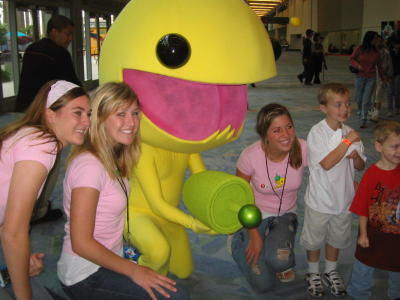 We arrive at the Anaheim Convention Center with what we like to call a “mini comic-con” setup. Even though the venue was smaller than what we were used to, we still went all out with our booth. 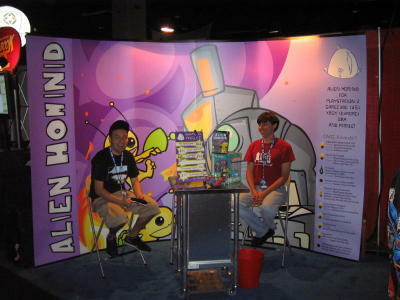 Since we were showing the Game Boy Advance version of Alien Hominid, we decided to hire some extra help for the booth. 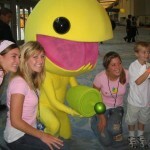 These are the first Alien Hominid girls to ever make a public appearance, and they did an awesome job! They brought everyone back to our booth, and took photos with the fans. 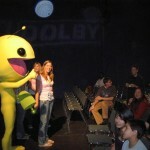 We donated several prizes to the Dead or Alive competition that was being held in the Dolby Digital Theater. Here you can see our Hominid and his female companions handing out our super cool buttons that we hand make here in our office. 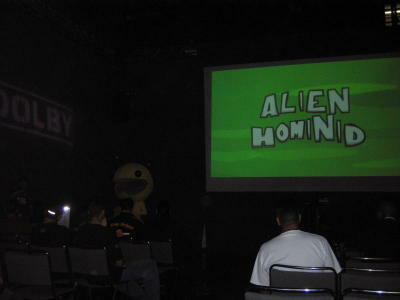 Thanks to Dolby and IGN we were able to showcase Alien Hominid on their enourmous screen. 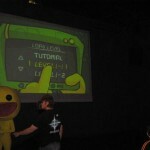 We ran thru a few of our levels and John Baez our producer said a few words about the development of the game. Thanks for everyone that came, we had a full house and I think that was the first time our Hominid friend was on the big screen. 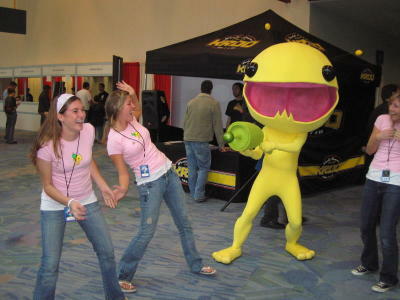 Everyone had a good time hanging out at our booth, playing Alien Hominid, taking pictures, etc, etc. Thank you IGN for having us. 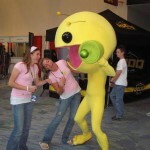 This weekend we are going to be at the first annual IGN LIVE. 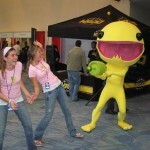 We will be selling the hard to find copies of Alien Hominid for PS2 and Game Cube. 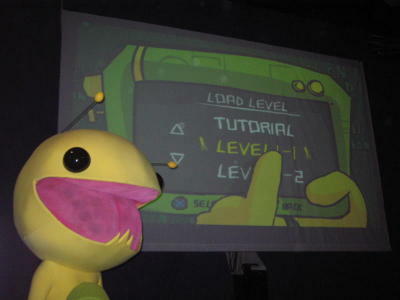 On top of all this, we are showing the upcoming version of Alien Hominid for the Gameboy Advance. 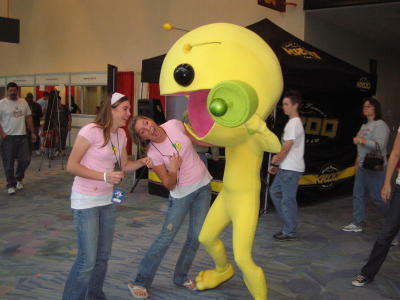 Here are some setup pictures for our booth that we will be using at IGN LIVE. You might notice the infamous drill press, that has made its appearance in other action shots in the past.